Comrades, I have noted several times that Soviet-style psychiatry has made its way to the USSA. And now, our Comrades here at the State Science Institute have begun the End-game. Soon, all the guns in the USSA will be confiscated as their owners are deemed "insane" and put into Gulags where their unprogressive hormones can be "treated." And then we will win. This is very much in line with God's Marx' goal of Fundamentally Transforming the human race into a species that is superior, and peaceful, and eminently Equal. Of course, we will have to kill off a few hundred million of Toxic Males to make it happen, but you know the saying about omelettes. 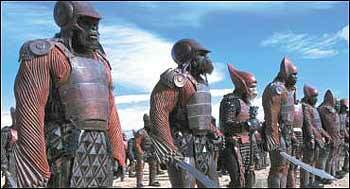 ...And if we ever need tough soldiers to defend us from danger, we can always train monkeys and give them weapons. It occurred to me that if someone were seriously talking about toxic femininity and how destructive and dangerous females are to the world we live in, and that the entire notion of "being a woman" needs to be eradicated from our consciousness and our culture... every normal person would be horrified and disgusted. There would be no support, let alone academic discussions. Imagine a similar article written about femininity. You can't. It's a one-way street, comrades. The other direction would be unimaginable. Just like an attack on a leftist group by the MSM is unimaginable. The media never uses terms like far left, ultra left, or extreme left. They don't exist. This is a perfect narrative, comrades. The Long March can only go in one direction and not a step back. The issue is never the issue, the issue is always the revolution. The best advice for boys is to be a girl. It's also a great way to earn a living, something that back in the patriarchal dark ages was seen as a masculine role. The Lysenkoism of psychology will see a hundred flowers bloom. Did not the 1970s feminists -- Betty Friedan, Germaine Greer, et al. -- attempt to do this, decrying"femininity" as a patriarchal imprisonment of womyn? Thus, in order to liberate womyn, one had to eradicate "femininity."